You can register with our practice by completing a registration form which can be obtained from our reception staff. When you register we will ask you to make an appointment to see one of our practice nurses for a new patient health check. This will make sure our records are accurate and all routine checks to promote your health and wellbeing (such as blood pressure/smear tests/mammograms etc) are up-to-date. If you have a preference for a particular GP please mention this when you register and we will try and accommodate your wishes. Once you have been accepted as a patient your medical records will be transferred to us. You do not need to inform your existing practice that you are moving though it may be courteous to do so. We are happy to see any relative or friend staying with you who requires medical treatment whilst away from home as a Temporary Resident. 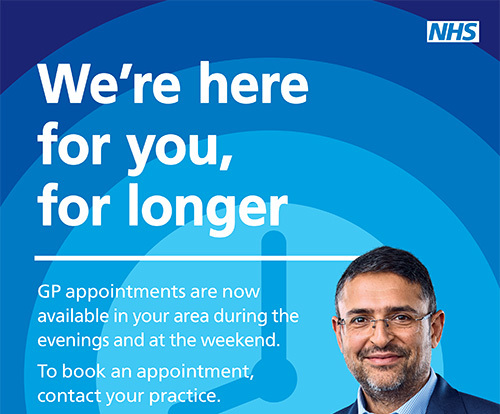 When making an appointment to see a GP as a temporary resident you will be advised to attend 10 minutes early in order fill out a simple temporay registration form. Budleigh Salterton Medical Centre provide all patients with a named GP who will have overall responsibility for the care and support that our surgery provides to them. We need to divide our patients evenly between all of our doctors, so they can manage their workload. Therefore to do this fairly and impartially, we have selected patients by surname to match to a doctor. You do not need to take any further action and will be informed of your named GP in due course. In the meantime, if you wish to be told the name of your accountable GP, please ask the receptionists when you are next in the surgery. If you have any questions, or wish to discuss this further with us, please contact us on 01395 441212.